Perfectly formed this is the ideal picnic table to combine good looks with functionality. Club Price: £332.99 - Save: £37.00 Join Today! Make the most of outdoor dining with the luxurious Madison Picnic Table. 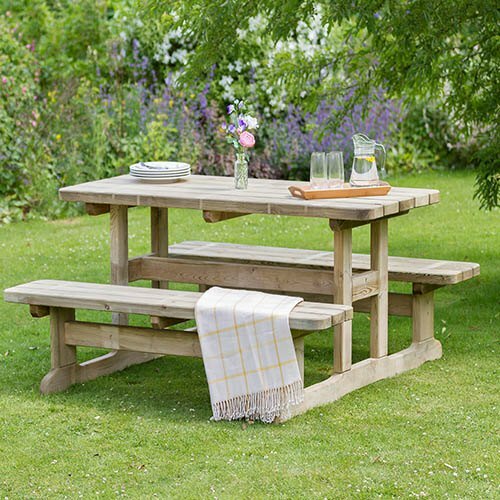 This impressive picnic table makes the perfect place to relax with family and friends in the garden and is ideal for breakfast, lunch or dinner. With its fixed base structure and solid timber frame, it's a clean and beautifully crafted picnic table to make the most of al fresco dining in your own garden. The Madison Picnic Table is manufactured from high quality, pressure treated, FSC® Certified timber to last longer, and comes with 10-year guarantee against rot so you can be sure that this product will last and remain to be a beautiful feature in your garden. Dimensions: 1.60m x 1.63m x 0.76m, assembly required - This product is 2-person assembly.